creativity | Shelf Elf: read, write, rave. So, do you sometimes go through phases of feeling disconnected from life, like you’re observing things, but not really a part of what you see going on around you? The end of the school year often does this to me, as the summer inches closer. I’m always surprised that I don’t feel pure elation the closer the school holiday gets. Instead it’s mostly just plain exhaustion and glazed-over-ness. The other day I was walking home in a daze in the rain after a super long day. It was really coming down and I had too many bags and a too-small umbrella and I was getting soggier and grouchier with every step. “Grumble grumble,” I thought as I squelched step by step closer to home. And then I saw her. A kid, probably six years old, wearing a pink raincoat and matching rubber boots. She was leaping around in the rainwater that was rushing down the street like a mini river in the sidewalk gutter. She couldn’t have been more delighted – or delightful to watch. That little moment woke me up. I may be bone tired right now, but deep down, I know I’m ready for a summer that’s full of the simple happy things life has to offer: popsicles, cool park grass, the scent of warm pine needles, dog kisses, lake sunsets, books (lots and lots), music in the kitchen, cat naps (with cat), movies, late nights hanging around with friends and family. Who knows, perhaps I’ll fit in a little puddle jumping? This entry was posted in Picture Books and tagged creativity, julie morstad, outside the box, picture book, play, simply read books on June 27, 2013 by shelfelf. In late March, most people can use a little more ! in their lives. I know I sure do. So when I spotted Amy Krouse Rosenthal’s sunny new picture book, I had hope that a smiley happy boost was headed my way. I was not wrong. It’d be near impossible to read Exclamation Mark and not be charmed and cheered. You know when you read a book, and you can just tell the creators had a blast making it? That’s this book. In fact, I’d say that I get this feeling when I read all of Amy Krouse Rosenthal’s books. This is a woman I’d like to spend the day with. I imagine we’d do something fun and probably kooky and we’d be laughing nonstop. Our conversations would be full of clever puns and silly stuff and we’d feel smart and giddy and just plain delighted to be alive. Not to mention, I love me a book that I could imagine using with wee folk right on up to Grade 8. (Cuz you know those Grade 8s aren’t all pros with their punctuation. Shocker). Exclamation Mark has a message that little guys can relate to, but the concept and execution are so clever that older kids will laugh on every page. So Amy, if by small chance you ever read this tiny shout out for Exclamation Mark, I’d like to say thanks for making stories as witty as they are wise. 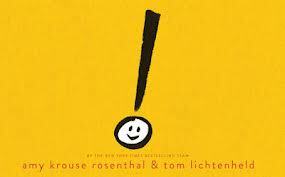 Exclamation Mark is published by Scholastic. This entry was posted in Picture Books, Teacher Titles and tagged Amy Krouse Rosenthal, creativity, picture book, punctuation gets cute, Scholastic, Tom Lichtenheld on March 28, 2013 by shelfelf. 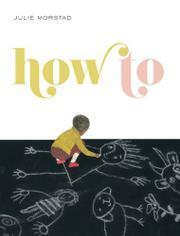 This darling picture book made me hope, hope, hope that there are still kids out there playing with paper dolls. As a kid, I remember getting one of those big activity books that was filled with tear-out paper dolls with little outfits for various occasions. I loved them. (Actually, I think I still do. I wouldn’t say no to these ones…) Julia Donaldson has written the sweetest wee story about a little girl who knows how to play the old fashioned way, to make her own fun with paper and scissors and her imagination. You could pack this one up with some scissors, and some paper and pencil crayons, and you’d have the perfect birthday present, I’d say. 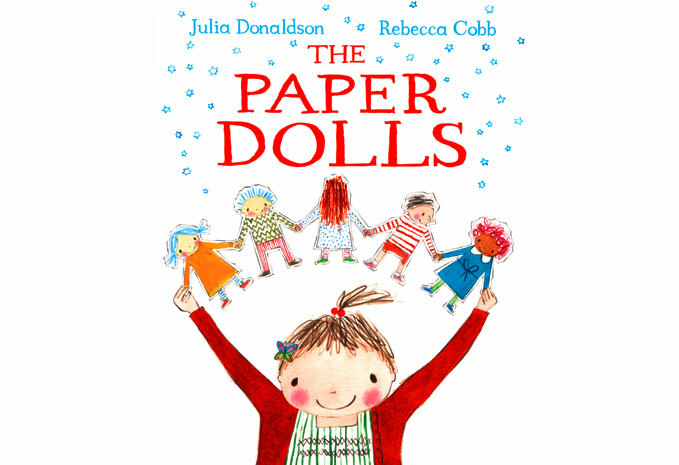 The Paper Dolls is published by Macmillan Children’s Books. This entry was posted in Illustration, Picture Books and tagged crafty kids, creativity, family, imagination, Julia Donaldson, Macmillan, Rebecca Cobb on January 21, 2013 by shelfelf. Things might have turned out differently, oh so differently, if only Crafty Chloe had been around when I was seven. 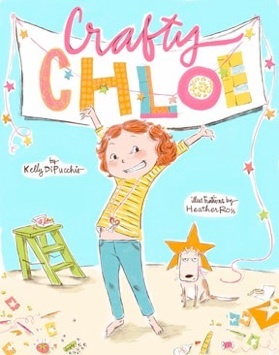 Crafty Chloe by Kelly DiPucchio, illustrated by Heather Ross, celebrates individuality, ingenuity, googly eyes, and glitter. Chloe loves making stuff, and it’s one thing she’s really good at. She makes flowers out of coffee filters and one of a kind clothes for her dog and she believes that “anything becomes less boring with googly eyes on it.” So when she goes shopping for her friend Emma’s party and another girl nabs the present she was planning on getting, Chloe plays it cool. “I’m going to make her something special that you can’t even buy in a store,” she says. Turns out it’s easier said than done, but after a little hard work and some serious crafting skill, Chloe makes something amazing. I’ll just say it. I don’t think I’d change a thing here. This story, and Chloe, will skip straight into your heart and make you want to pull out that box of macaroni and design yourself a statement necklace. Who says it’s too late to embrace my inner crafter? (And if I’m really stuck, I can always head to craftychloe.com for some cool craft ideas, step by step, just the way I like it). Crafty Chloe is published by Atheneum Books for Young Readers. This entry was posted in Illustration, Picture Books and tagged 30 Picture Books, Atheneum Books for Young Readers, crafts, creativity, Heather Ross, Kelly DiPucchio on September 25, 2012 by shelfelf. There are some picture books that I buy for the library with a particular teacher in mind, something that might not find its way into everyone’s classroom, but that will be just perfect for that one person’s program. 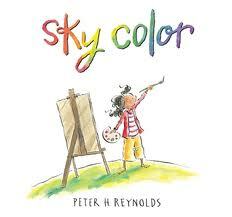 And then there are books like Sky Color, the third in Peter H. Reynolds’ “Creatrilogy,” after The Dot and Ish. It’s going to get snapped up before I can even put it out on display. This I know for sure. Teachers have a lotta love for The Dot and Ish. I will be a hero when they find Sky Color in the library. “How am I going to make the sky without blue paint?” This is Marisol’s problem when she agrees to paint the sky for the library mural, but finds that there isn’t any blue in her box of paint. So, quite literally, she is forced to think outside the box. Where else to look for answers than out the window? This is exactly what Marisol does on the way home, and that night she dreams of a whole different kind of sky, “swirling with colors.” In the end, Marisol finds her way, and she finds sky color. Reynolds loves exploring the notion of self-expression and the individual’s creative journey beyond perceived limitations and rules. On the last page, he dedicates the book to someone in his life who “took the blue paint away and helped me paint – and think – in sky color.” I like that while Reynolds’ books are certainly about creation and art, the ideas and lessons in them can be extended beyond these areas, informing how kids think and see the world in general. The illustrations start off quite muted, mostly black and white and shades of grey with only touches of colour, until the sky comes in, and then Reynolds shows off a gorgeous wash of orange and yellow and pink and purple. The last two pages contain the children’s mural, in a wordless double-page spread filled with colour, and all of the young artists standing in front of it, taking it in. I’m sure Sky Color will inspire a similar response in all who read it. If you need a little awe in your day, look no further. Sky Color is published by Candlewick. This entry was posted in Illustration, Picture Books, Teacher Titles and tagged 30 Picture Books, Candlewick, creativity, creatrilogy, outside the box, Peter H Reynolds, problem solving on September 9, 2012 by shelfelf.